Should You Always Use the Same Bet Size? Bet sizing is your friend in poker. But “always bet the same amount” has become somewhat ingrained as a stratagem for many players. In this episode, James “SplitSuit” Sweeney responds to the question “Should I Always Use the Same Bet Size?” to explain why deviation is sometimes very important. Tune in for a definitive answer on this frequently asked question, as told by a professional poker coach, and read his new book Unfolding Poker: Advanced Answers to the Most Frequently-Asked Poker Questions for more valuable info. Chapter 18: When Should I Change My Bet Size? The simple answer is ‘no’. Each situation is different and players respond to sizes differently as well. Bet sizing is an art and a science, and I want you to walk away from this chapter with a deeper understanding of what goes into choosing ideal sizing in various spots. This is not the end-all/be-all resource for bet sizing, but it will be a great primer with actionable takeaways. A static bet sizing strategy uses the same size in all similar spots. So a player would always use X size when open-raising from UTG whether they have AA or 54s, and they would always CB for Y size whether they flop top set or a gutshot. The benefit of this strategy is that your opponents will not be able to gauge the strength of your hand based solely upon your bet size. A dynamic bet sizing strategy uses different sizes in various spots. So I might CB 1/2 pot with a bluff and 3/4 pot with a monster. Or I might 3bet to 10bb against a reg and 3bet to 17bb against a fish in that same spot with KK+. The exact size I choose is dependent on many variables, but it is done in an exploitative way. The benefit to a dynamic sizing strategy is that you can tailor your exact size to maximally exploit your opponents. It is less simple since you have so many extra options to consider, but it allows you to maximize value in the long run. Another key concept when choosing bet sizes is the elasticity of your opponent. This is an economic term that applies beautifully to poker. Elastic: A player who will continue differently based upon the exact bet size. So they will give 1/2 pot bets action with a different range than they would give a pot-sized bet. Inelastic: A player who will continue relatively similarly against different bet sizes. So they will give a 1/2 pot bet action as often as they would give a pot-sized bet action. In general, fish tend to be inelastic. 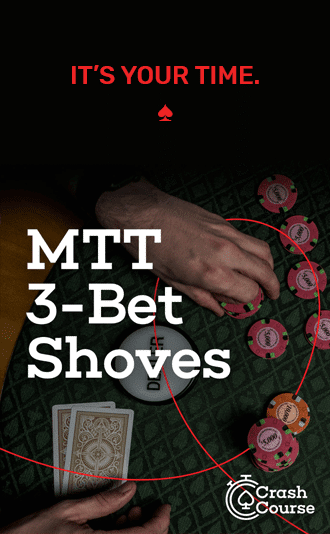 They make decisions based upon the absolute value of their hand and if they are going to continue with middle pair, they typically will regardless of your bet size. Now maybe they will not call a 4x pot-sized bet with middle pair, but they will call 1/2 pot and pot-sized at pretty much the same frequency. More knowledgeable players tend to be elastic. They make decisions based upon relative hand value and math. They need to be “right” less often when you bet 1/2 pot vs 2x pot, and thus they give action differently based upon the size you choose. These players may end up being inelastic in specific situations (where they have a set and refuse to fold against you), but overall they are elastic when facing bets. To make this more actionable, I wanted to share some of the ways that I tailor my bet sizing in preflop and postflop situations. These are key examples of where a dynamic bet sizing strategy allows you to make more money. An open-raise is when the first person to enter the pot does so by raising. It is common to see players use a 2.5x size in tournaments, 2-4x in online cash games, and 4-7x in live cash games. These are typical static bet sizes, but not always the best. I want one or both of the weak players to myself. The larger size is a disincentive to the players between myself and the button. I have a huge edge in terms of cards, skill, and position and weaker players are more inelastic. Thus if they want to continue preflop they will not be dissuaded because I added a few extra big blinds to my open-raise size. There are plenty of spots where you can open-raise smaller (e.g. when stealing to take advantage of players who fold too often with non-premiums) and larger (e.g. to target certain players). Do not automatically use the same size each time. Each spot is unique and there are plenty of ways to create more profitable spots with small changes to your sizing strategy. There are many formulas for choosing a raise size when raising over limpers. Maybe you use 5x + 1x/limper or something similar – but these are just static sizes. Three tighter players limp and I am on the button with KTs. In this spot I raise to 11bb often. This is larger than any static formula would suggest, but it allows me to apply maximum pressure to their ranges. If going to 6bb gets me called, but going to 11bb creates many folds – I will choose 11bb all day long. Two weak players limp and I am in the SB with KK. In this spot I would go to 12bb. Now, you may look at this spot and the previous one and say “great, just raise super large when attacking limpers!” But the thought process is more reasoned than that. In the first spot I raise large to apply pressure and create folds (and if they do not fold, I still have position, cards that can perform well, and hopefully a skill edge). In the second spot I also raise large, but to generate more value against weak players who are likely inelastic when they limp/call. Listen to this podcast episode and get a deeper understanding of how I attack limpers. Many players use a simple formula for this as well. Often times somewhere between 3-4.5x the size of the open-raise. But again, there is room for breaking away from the formula with the focus on generating extra profit. When it comes to 3betting, I almost never use a size smaller than 3x in cash games. Sizing smaller than that tends to eliminate fold equity and removes the ability to make outright profit with the bluff part of my range. That being said, I go larger than 4.5x quite often. I do this in spots against tighter players who might give action with hands like TT, JJ, and AQ if I go to 3.5x, but would actually fold them if I go to 5x. You will find range contortion like this often against elastic players who dislike giving bigger sizes action with marginal parts of their range. And of course you can use larger 3bet sizes with your monster hands against weak players. Capitalize on the fact that are inelastic with hands they want to see a flop with, and punish them when you have huge edges in your favor. Most of these adjustments skew towards using larger sizing. There are times to deviate from default sizing and go smaller – and if you spend the next 20 minutes pondering them I bet you can come up with at least three +EV situations. I also want to share some key examples where you can deviate from default bet sizing postflop. Again, look for the deeper reasoning and understand the underlying logic in these deviations. Many players use the same bet size whether they are betting the flop, turn, or river. And many use the same bet size whether they have the nuts or total air. If you always CB for 2/3 pot (or similar), I would argue that you are leaving heaps of money on the table. Here are a couple of key places where I deviate from betting 2/3 pot. When I have a dominating hand in a HU pot against a weak player I almost always use larger sizing. Why bet only 2/3 pot if they would gladly give me action with second-best hands at the same frequency for the larger size? It is not uncommon for me to CB around pot-sized in these situations. On the other hand, there are spots where I bet smaller than 2/3 pot. For instance, if my opponent is going to be inelastic with the bottom of their range, meaning they will fold weak hands regardless of the size, I risk less with my bluffs. This play is very profitable against weaker regs especially when they are out of position. If most of their range misses, and they will fold with those misses even if my size is smaller – why risk more if I do not have to? Against fishy opponents I use overbetting to maximize value when they become inelastic with dominated parts of their range. For instance, if I think their range contains many second-best hands, and that those second-best hands would call me down even against larger sizing, I overbet often. The more inelastic they are, the bigger I go. There are also spots to overbet and apply maximum pressure to tighter players. If a tight player would call with second pair or better if I bet 2/3 pot, but would fold anything but two pair or better if I bet 1.4x pot, I would certainly want to consider the larger sizing when bluffing. Players who are elastic have a sizing threshold where they no longer want to give action with certain hand strengths. When you can identify that threshold (hint, it is often times near the size of the pot), you can easily bluff them with impunity. Since normal bet sizing is around 1/2 to 2/3 pot, smaller sizes are under 1/2 pot. I actually use this size often when trying to induce raises from my opponent. These smaller sizes are easy to spot and they look weak. Passive players are less likely to raise in general, and thus I reserve this strategy for when my opponent is aggressive and more apt to take the bait. Never do this without a clear plan when you face the raise. I use this strategy often when my opponent floats liberally and would fold to a normal bet often, but would feel obligated to fight for the pot if they smell weakness. I also use smaller sizes to induce calls from weaker parts of my opponent’s range. This is super useful against passive opponents who would not see the smaller size as weakness, and thus would not raise me. No, these passive players are looking for an excuse to call and the smaller size does exactly that. I execute this strategy with marginal parts of my range. Notice above that I normally overbet my monster hands against these players. While a good player would recognize that I overbet my huge hands and bet small with my weaker hands – these players are not that adept. So rather than always checking with marginal hands, consider going for thinner value with a smaller bet when it can induce a wider array of calls from your opponent. As you can see, there are plenty of good situations to veer away from using “default” bet sizes. Sometimes larger sizes perform better, and other times smaller bets actually create more profit. Whenever you choose a bet size, make sure to have a clear reason. A default size is a starting point, but certainly not always the best option. Too many players get lazy when it comes to bet sizing. Make sure you are diligent in your sizing, and understand that improvements in sizing can greatly impact your winrate. It is not easy at first, but with practice and study you will be able to size with more precision and generate more value along the way. One final note is that some players will argue that you should always use the same bet size so that your opponents can never deduce your range based upon your size. There is merit to this statement, but most of your opponents are NOT great hand readers. The lower level your opponent is thinking on, the less you need to worry about balancing your ranges and sizes. The lower level your opponent is thinking on, the more you can focus on purely exploiting them and bet sizing with precision is a huge way to do that. So with all these tips, especially in microstakes or against our favorite fishy opponents / perhaps too loose lags: without even TPTK do you continue to hammer away after the flop? I mean with say, top pair decent kicker and a safe board. Not great hands but good, and you know the player will call down with much much worse, call down with better top pair / kicker, and maybe 50/50 on calling vs raising themselves with TPTK. With no resistance do you big bet on the flop and continue if it stays safe? I feel split because often on these microstakes tables you’ll see fish call down massive bets with K5 just because they flopped the K for top pair. If this is the case then I guess if you get HU with them and hit top pair or better you should always bet because their range is so garbage that the times you lose, while yes will be big, you will win the same amount much more often.